Home Search results for "captain cooked"
‘Captain Cooked’ Book Signings – Meet The Author! 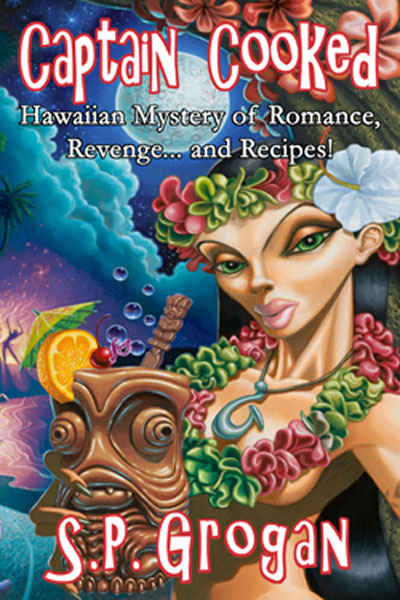 Listen, there’s a new book out and it’s an island culinary/romance/mystery novel that got me at its great title. It’s called Captain Cooked. Full disclosure: I know about this book because its author, Steve Grogan, hired me before publication to review it for Hawaiian cultural accuracy. It’s set here on the Big Island, and he wanted to make sure he had his Hawai‘i facts down. He did a similar thing with his previous book, a mystery titled Vegas Die. (Great book titles, huh?!) Nobody found the hidden dagger. Read where it was. Vegas Die, published by Addison & Highsmith Publishers, has gained recognition as a “Best Seller” in the West, with its special twist featuring a dagger worth $25,000 hidden somewhere in the Las Vegas Valley, with clues to be found within the book. The fictional plot centers around the murders of retired mobsters with the Mayor of Las Vegas becoming the #1 suspect. Back to his current book: Steve Grogan is going to be here, on the Big Island and O‘ahu, signing books, and you should swing by. I’m going to stop by when he’s at Basically Books in Hilo on Saturday. He is an interesting guy and you should stop by, say hello and pick up a book, which he’ll sign for you. If you cannot make a signing, you can order Captain Cooked online. Please note: due to the impending Borders Chapter 11 bankruptcy filing the Honolulu book signings were cancelled and adjust your calendar accordingly. We went to Hilo Bay Cafe for dinner the other night while my mom was here visiting. That is such a great restaurant – inside it’s really got the ambience happening, in spite of its unlikely location in a strip mall adjacent to Wal-Mart, and the food is always so fresh and good. While there, I talked with them about getting some recipes for an author I’m working with. Stephen Grogan, a Las Vegas author of a previous book called Vegas Die, is, interestingly enough, writing a culinary/mystery novel set here on the Big Island. He hired me to edit the manuscript for Hawai‘i references and history and culture. He actually found and hired me through this blog, which proves that blogging is definitely worth the time and effort. We did all our business together by email. Steve’s new book’s title is great: “Captain Cooked.” How could I resist that? I did the edit, and helped him gather up some Big Island recipes to go into the book too. The chef at Hilo Bay Cafe has agreed to provide a couple recipes, too. There’s an interesting gimmick in Steve’s previous book. He hid a dagger somewhere in the metropolitan Las Vegas area, the book provides (kind of hard) clues to its location, and the person who finds it takes $25,000! People have been actively seeking it for quite awhile now. There’s even a forum where they go to discuss clues and such. He’s going to do the same thing with Captain Cooked, so stay tuned for how to win your $25,000! I’ll let you know when the book is coming out.